Arthur’s Day: The completely made-up Guinness holiday that’s ridiculed yet widely celebrated in Ireland. 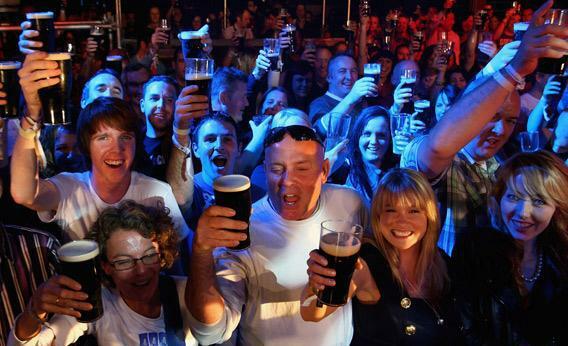 Guinness has created a new Irish drinking holiday that is ridiculed yet widely celebrated. An Arthur’s Day toast in Dublin, 2009. Photo by Clive Brunskill/Getty Images for Guinness. In 1799, after spending 40 years tinkering with various ales and porters at his Dublin brewery, Arthur Guinness decided to dedicate his company solely to the perfection of a single brew: a roasted barley-flavored porter with a creamy head. Two hundred thirteen years later, Guinness’ signature concoction is Ireland’s unofficial national tipple—and internationally, Guinness is as synonymous with the Emerald Isle as leprechauns and shamrocks. But in recent years, fickle youngsters across the British Isles have shown a growing penchant for lagers, microbrews, and fruity alcoholic beverages, unlike older generations, who’ve stayed loyal to “the black stuff.” That, combined with a recession-driven decline in Guinness sales, led its parent company Diageo to develop a marketing ploy that might rival even Hallmark’s designs on St. Valentine’s Day: In 2009, to mark the 250th anniversary of Arthur Guinness’ signing a perhaps slightly far-sighted 9,000-year lease on his St. James Gate brewery, Diageo created Arthur’s Day. The goal of the made-up holiday was to drum up new interest and sales by combining concerts featuring high-profile musical acts with the chance for young people to get pissed on Guinness in the street. Though its effect on sales trends remains to be seen, the first few Arthur’s Days seem to have worked as far as getting out the crowds (and today’s celebration looks poised to be just as big). For the past three years, on a predetermined Thursday toward the end of September, hundreds of thousands of people have turned up at their local (as the Irish call their neighborhood pub) and at gradually expanding international events, to raise their glasses at exactly 5:59 p.m. and toast “To Arthur!” (On European clocks, that time is known as 17:59, a nod to the year of Guinness’ lease-signing.) The Thursday slot conveniently coincides with student drinking night, and the timing of the toast captures the after-work crowd. The success of Arthur’s day is unusual. You typically don’t see Nutella fans storming grocery stores on Feb. 5 for World Nutella Day or Patron addicts lining up shots at every bar on National Tequila Day in late July. But Diageo has managed to pack pubs on a day that celebrates Guinness and Guinness alone. That’s largely due to the intense loyalty people still feel for the “heritage brand,” and the fact that drinking is embedded in Irish culture, says Shane Hegarty, arts editor and columnist for the Irish Times in Dublin. “There’s a sense of pride even among people who don’t drink Guinness,” he says, pointing to the widespread Irish approval that President Obama got when he visited his ancestral town last May and made time for, per Hegarty, “gobbling down” a pint of Guinness. Despite Arthur’s Day’s remarkable success, the holiday has had its haters from the beginning, the spiritual kin of those in the United States who belittle candy manufacturers for creating Sweetest Day and other industries for promoting made-up marketing holidays. Hegarty published a story on Sept. 15 calling Arthur’s Day a “black mark” on Dublin that “has forced itself onto the calendar like a drunk throwing a threatening arm around the shoulders of a sober unfortunate on the last Nitelink [bus] home,” and he says there was a rush of positive feedback from readers agreeing with him. “Ireland can be a great nation, but it is time to wise up and lose our ‘drunken Paddy’ reputation,” wrote Council of State member Ruairí McKiernan in a letter to the editor. Twitter haters have been even more blunt in their derision: “I am trying to organise Martyrs Day in Dublin whereby a bunch of us kill ourselves in the city centre so Arthur’s Day gets cancelled,” tweeted comedy writer Colm Tobin. Guinness plays up Arthur’s Day’s musical celebrations in Dublin (ones that just happen to have plenty of pints available) and is sponsoring other, smaller music events in 55 different countries on Sept. 27 and 28 this year. The 2012 headliner musicians in Ireland and the U.K. include acts like Tom Jones, Example, Fatboy Slim, Mika, and Tinie Tempah. Smaller Irish bands also will play at most of the estimated 500 pubs participating in official events across the country. And for every person who checks in on Guinness’ Facebook page, Diageo will donate 5 euros to an Arthur Guinness Fund that supports community projects. For his part, Hegarty’s a longtime Guinness drinker himself but finds it hard to swallow a pint on Arthur’s Day because of the way it “blanket bombs” the country with Guinness. Which makes one wonder why Arthur’s Day hasn’t yet caught on at American universities. But if the holiday continues its juggernaut expansion, perhaps one September day in the near future large numbers of Americans, too, will be able to raise a toast to the promotional brilliance of Guinness.